Micro-businesses in Ireland are more innovative than their UK and US counterparts, according to research from Cork University Business School. In Ireland, such companies, with nine people or less, constitute 90pc of businesses, and employ more than 400,000 people. Four out of 10 micro-businesses here have introduced new or improved product or service over the past three years. This compares to 33pc and 36pc in the UK and US respectively. However, innovation varies across Ireland and is lower in peripheral regions – particularly the south east and Border areas. Meanwhile, Irish micro-businesses are mainly focused domestically, with just four in 10 exporting goods or services internationally. The average percentage of sales derived from international markets is 12pc. The focus on the domestic market looks set to continue, with only one in four looking to grow to national or international scale, according to the survey of over 1,500 small businesses here. In relation to technology, the adoption of digital technologies by micro-businesses in Ireland is strong and growing, the report finds. 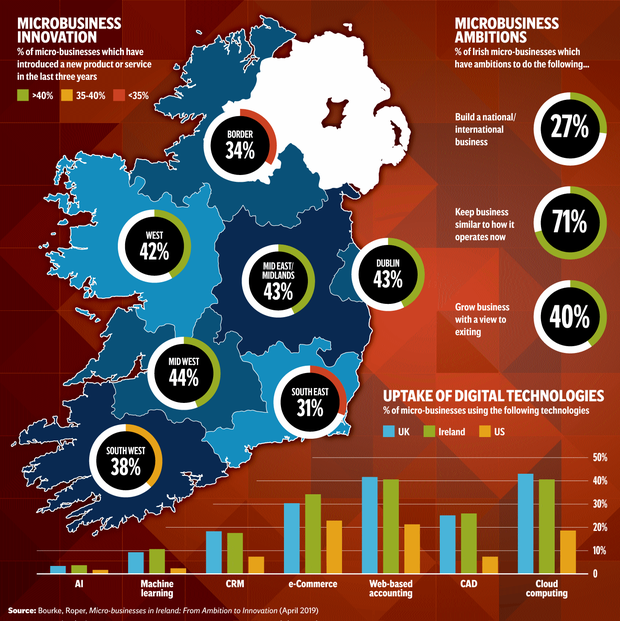 In fact, the uptake of digital technologies by micro-businesses in Ireland compares well with those in the UK and is “considerably higher” than those in the US. Among the most popular technologies that companies benefit from is cloud computing and web-based accountancy software, with 40pc of small firms using these. Elsewhere, one in three businesses are using e-commerce. However, while some small Irish businesses may be more tech savvy than their UK and US counterparts, approximately one in four here have not adopted any digital technology at all. The study also looked at the personal ambition of business owners across the three countries, with notable differences in the findings. Two-thirds of micro-business owners in Ireland “want to be able to retire”, while almost half want “to build a business I can hand on to my family”. Only 43pc want “to have a chance to build great wealth or income”. This is a huge contrast to the US, where two-thirds of micro business owners state this as their personal ambition. While the ratio of male-to-female owners is two to one, the ambitions of the different genders are broadly similar. Dr Jane Bourke, economist at UCC and co-author of the report, said: “These businesses are our plumbers, our builders, our accountants and our mechanics. They play an important role in the fabric of Ireland’s national and local economy.